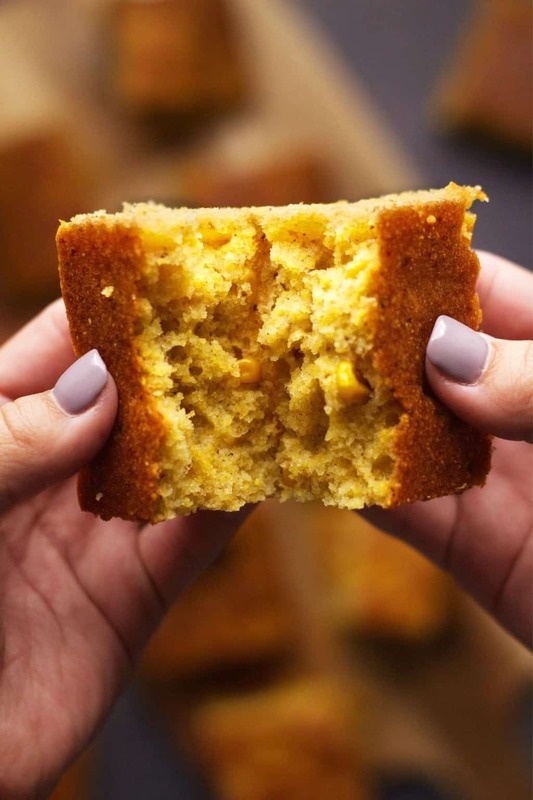 Perfectly sweet vegan cornbread with whole corn kernels. Wonderfully moist and tender and makes the perfect side dish. Ideal comfort food! 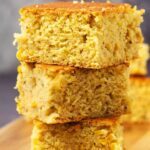 This vegan cornbread fits perfectly into the category of vegan comfort food! If you wanted to make it at the same time as other vegan comfort foods like a nice big bowl of vegan chili well that would be just fine! If you’re anything like me then you also love bread. And there’s nothing wrong with that. 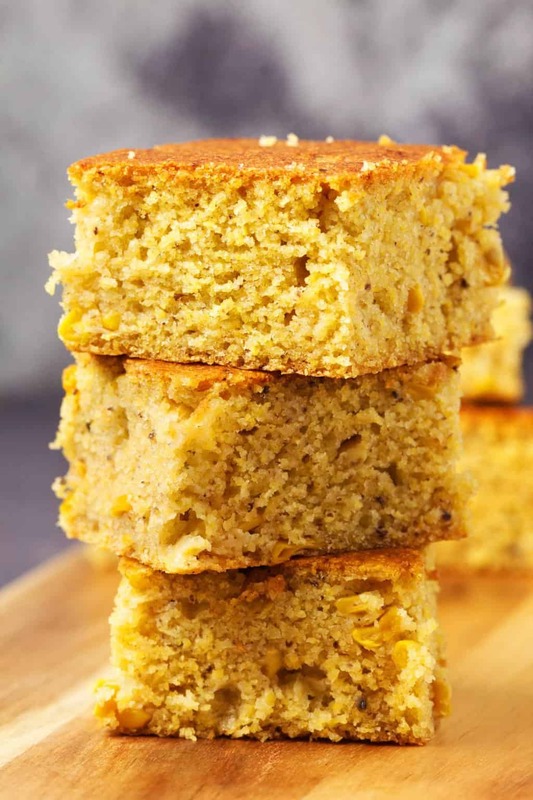 This vegan cornbread is really something between bread and cake. I wanted it to be sweet so there is some brown sugar added which adds just the right amount of sweetness. It’s perfectly sweet but not overly sweet. I mean it is cornbread after all. 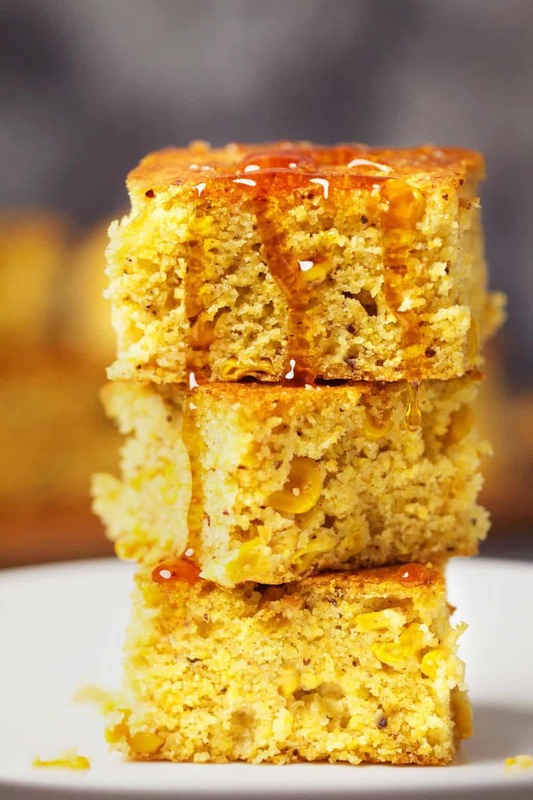 And cornbread isn’t a totally savory thing, it is meant to be slightly sweet. Add some yellow cornmeal (also called Polenta in some parts of the world like Australia and South Africa) to a mixing bowl along with some all purpose flour, baking powder, baking soda and salt. Add some apple cider vinegar and soy milk to a measuring jug and let them curdle together. Then prepare a flax egg (a simple mix of ground flaxseed meal and water, full instructions are in the recipe card at the bottom of the post). Then add some vegan butter to a pot on the stove and melt it and then add in some brown sugar and whisk it up with the melted vegan butter until the brown sugar has dissolved. Remove the pot from the heat and add in some maple syrup, then add in the soy milk and apple cider vinegar mix and whisk it up together. Add your wet ingredients in with your dry and mix together. Add in your flax egg. Lastly add in your whole corn pieces and stir in. 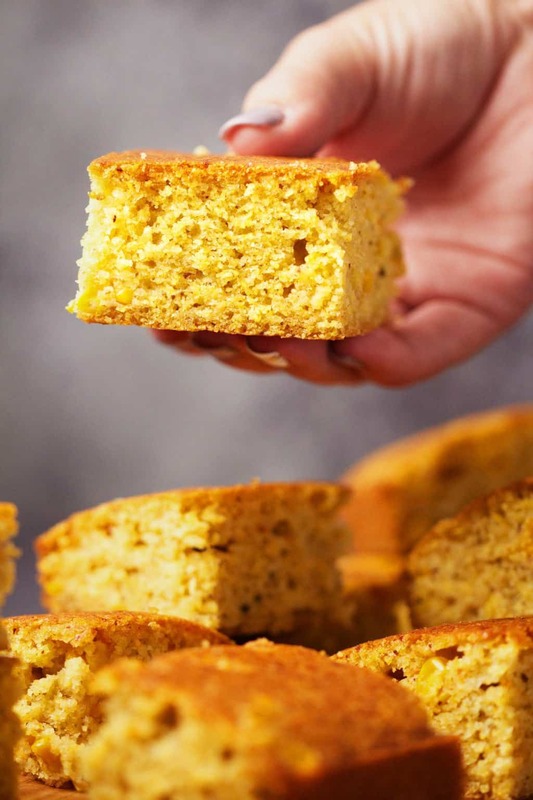 There are two ways to make this cornbread and the recipe is the same either way, the only thing that changes is the baking time. You can either make it in a square dish, either an 8×8 square dish or a 9×9 square dish will work fine or you can make it in a loaf pan. 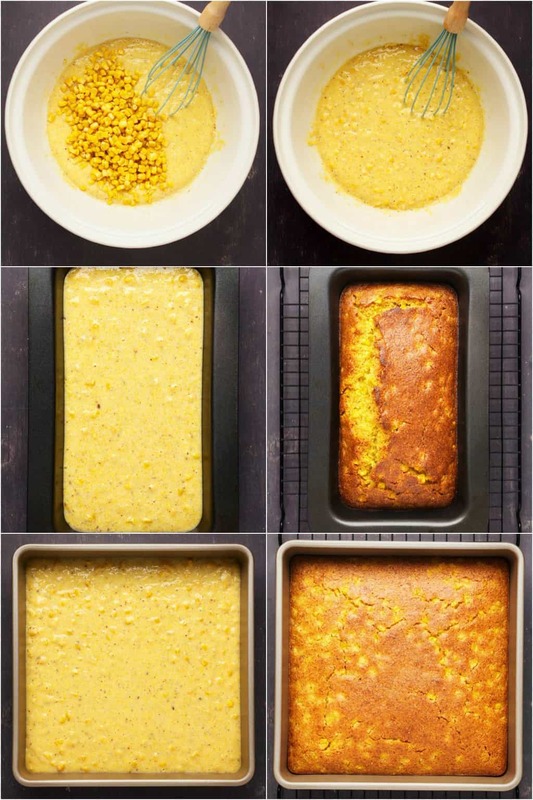 The more traditional way to make cornbread is to make it in a square dish and then cut it into squares. But I also like it as a loaf, so you can do whatever you prefer. If you bake it in a square dish the baking time is a bit shorter, so if you’re wanting to make it as quick as possible, then a square dish is going to be the best bet. 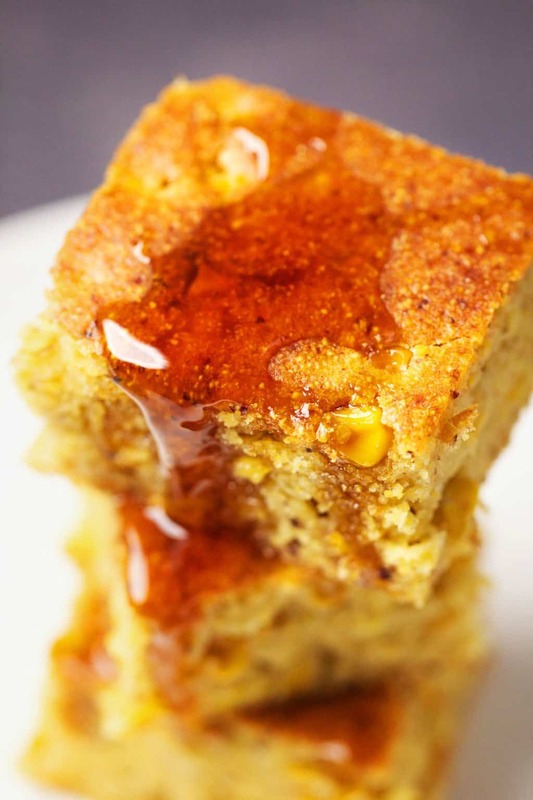 Spread with some vegan butter or drizzled with some maple syrup, or just eaten as is (as Jaye preferred it), this cornbread is fabulous all ways. Can I make this into muffins? Yes! This recipe adapts wonderfully to 12 delicious cornbread muffins. Check out our vegan cornbread muffins recipe. Can I make this recipe gluten-free? I’m not entirely sure since I haven’t tried it yet. Your best bet would be to use a gluten-free all purpose flour blend that can be used as a direct replacement for wheat flour in baking. If you do that, it will likely work out fine. Where can I get vegan butter? Vegan butter is just a way of referring to a vegan ‘buttery’ product. This could be a brand like Earth Balance in the USA or Nuttelex in Australia or Vitalite in the UK. You might not have a product like this available but might still have a brand of margarine that would work fine and is vegan by ingredient. Alternatively you can make your own homemade vegan butter using our recipe, it works great in baking. While it does keep for a few days wrapped up or stored in an airtight container, it is just SOOOO good straight from the oven and as fresh as possible. Our vegan zucchini bread is so fluffy and moist you’ll never suspect it’s hiding some green vegetables in there! 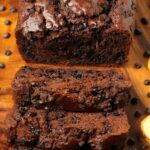 Our vegan chocolate chip banana bread is so decadent you’ll hardly believe it and our vegan chocolate banana bread is for chocolate lovers everywhere. 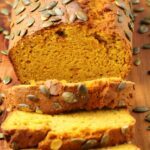 Our vegan pumpkin bread is deliciously spiced, packed with pumpkin flavor and topped with pumpkin seeds. A must try. 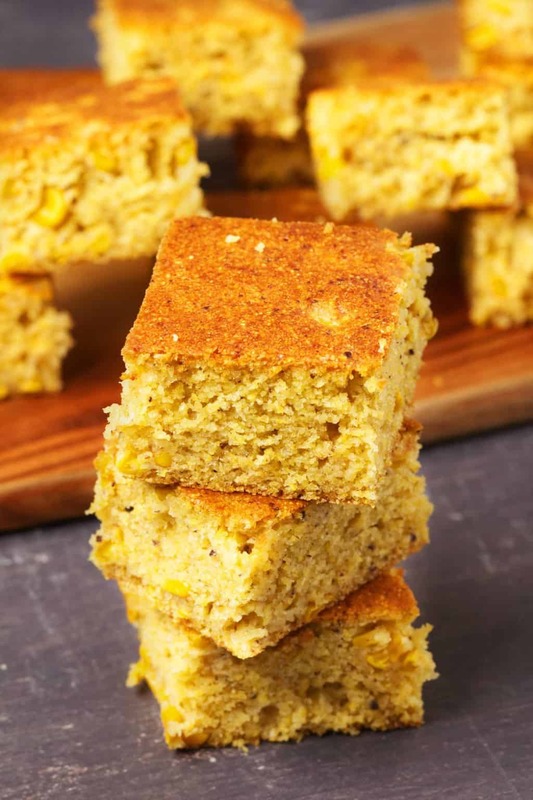 So let us know what you think of this vegan cornbread in the comments and please rate the recipe too! Sign up to our email list for a fabulous vegan dinner recipes ebook with 10 delicious recipes (entirely free) and to stay updated with all our latest recipes posted to the blog. Add the yellow cornmeal to a mixing bowl and sift in the all purpose flour. Add the baking powder, baking soda and salt. Prepare your flax egg by mixing 1 Tbsp Ground Flaxseed Meal with 3 Tbsp Hot Water and allowing to sit for a minute. Melt the vegan butter in a pot on the stove and then add the brown sugar and whisk until the sugar has dissolved. When the sugar is dissolved into the butter, remove from the heat and whisk in the maple syrup, and then add in the soy milk and apple cider vinegar mix. Add the wet ingredients in with the dry ingredients. Then add in the flax egg. Use a hand whisk briefly to remove any lumps. Lastly add the whole sweet corn pieces and mix in. Pour the batter into your prepared baking dish. Cook for 25 minutes or until a toothpick inserted into the center comes out clean. 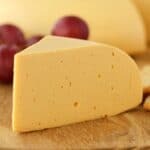 *Yellow cornmeal is also called Polenta in Australia and South Africa. *For the best accuracy in this recipe – weigh your flour and yellow cornmeal using a food scale. 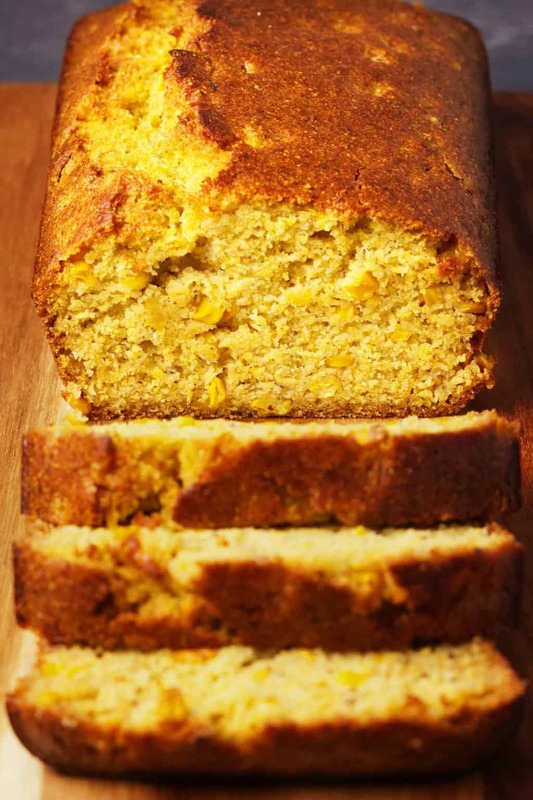 *You can make this in a 9×5 loaf pan for a loaf of cornbread that you can cut into slices. All the directions stay exactly the same, just spray your loaf pan with non-stick spray and line the bottom with parchment paper. Bake for around 35-40 minutes or until a toothpick inserted into the center comes out clean. 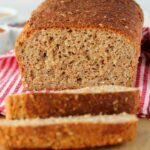 *This recipe has recently been updated with new photos and showing how to do it both ways (loaf pan and square dish), but the recipe itself is identical. Oh so yummy!!!! 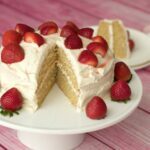 Your recipes are delicious but I love your photos even more. The way the food just jumps off the page and makes my mouth water is my favourite part of your wonderful site. Keep up the fabulous work! These came out the best I ever tried to bake! I made some slight adjustments. I added an extra 1/4th tsp of baking powder (a pancake recipe I use, calls for 3.5 tsp, and the pancakes end up a 1/2″ thick) so I thought an extra 1/4th would give a little extra boost, not to fall. I also subtracted a Tbs of maple syrup (it’s expensive), and added a Tbs of regular applesauce, instead. I also used “medium grind” corn meal, that I buzzed up, as much as possible, to reduce any graininess. The came out with dome tops, and were super moist. Just what I was trying to achieve. Hint: if you want a lighter in color appearance, substitute white sugar, for the brown, and maple sprinkles (granulated maple sugar) for the maple syrup. I omitted the corn kernels, as I don’t like chewy things in my baked goods. The batter, was like cake batter, not runny, and not pudding like, or hard to stir. Super yummy with vegan butter melting and soaking in them! This is the first vegan cornbread recipe I have tried and it will be the last! So good! I left out the maple syrup because I don’t like it too sweet and added some diced sautéed jalapeños. Awesome!! Not 1 hour since it came out of the oven and it is nearly gone! I do not keep imitation butter, so I used peanut butter – it’s vegan, it’s butter. It smelled kind of odd, so I googled peanut butter cornbread just to see how weird it was. So, sure enough, other people have done it. Thank you for the tweakable yummy. 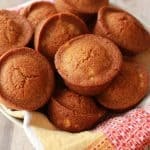 Is it possible to use this same recipe for muffins? 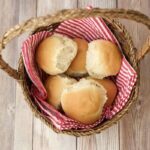 Hi Mae, I made cornbread muffins – the recipe is very much the same but there were some slight changes – check it out here: Cornbread Muffins. Have you tried using mashed avocado instead of vegan butter (or oil in other recipes)? Much healthier and you can “grease” the pans with the inside of the peel. It’s a 1-1 replacement but you will need a little more liquid and baking temperature by 25 degrees while increasing bake time. 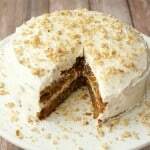 But the results are so worth the trouble — moist and nutrient-rich! For more nutrition, you might also try date sugar, which is just ground dates, instead of sugar — replace 1 for 1. I haven’t tried that with avocado but am definitely a fan of dates, thanks for the suggestions! This is the best cornbread I’d ever had, pre-vegan or post. I make only a few small changes.. I used frozen organic corn, because I try to limit my salt intake. I added 2 jalapenos, finely chopped to the batter. My personal rule is… food must have heat. Lastly, I cooked the bread in a small round cast iron pan. I think cast iron and cornbread go great together. I can’t express enough how much I love your recipe!! This bread was awesome but a little too sweet for our liking…might try it again and omit the maple syrup and use white sugar. Also, I have a recipe that is not vegan but I have veganized it….it uses stone ground cornmeal which might be good as well. 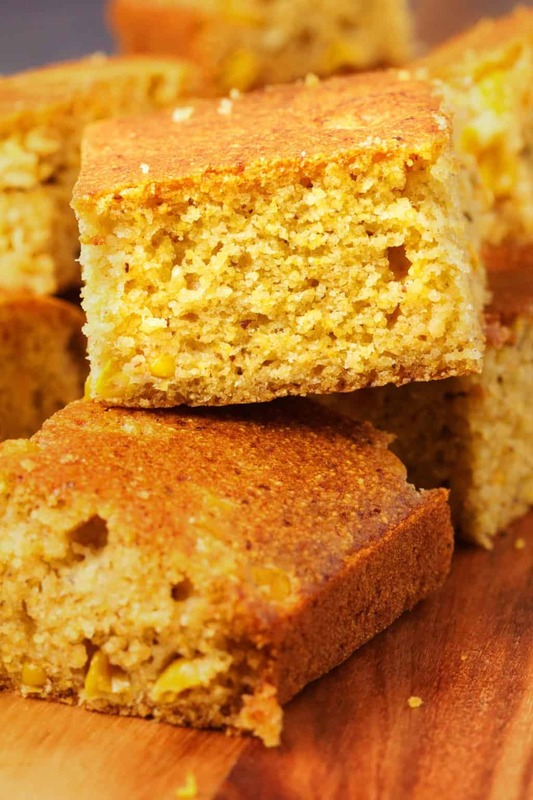 Thanks for sharing your cornbread recipe. I made it today for the family & everyone loved it! The texture was perfect & I thought it had the right balance of sweetness (although I only used half the amount of syrup). 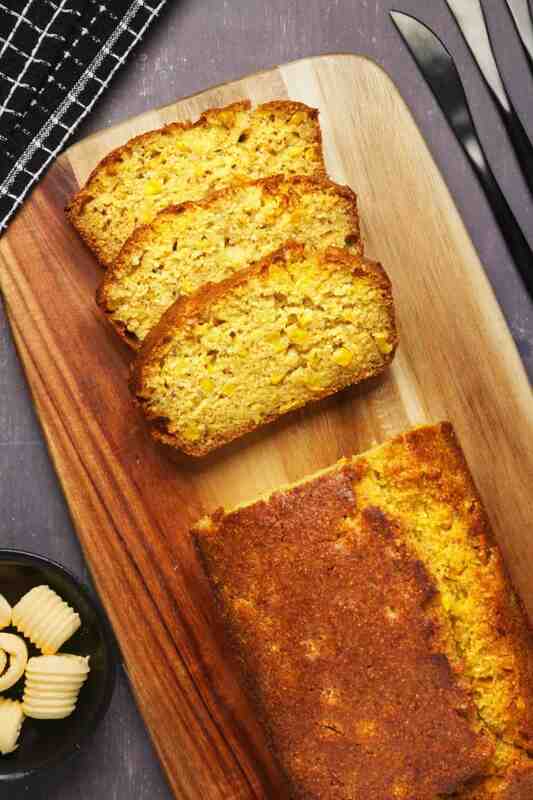 I have just made the corn bread and waiting for the results, I wanted to ask you can I use spelt flour for the all purpose flour, I was not sure but used it anyway. Hi, great recipe, I’d love to try making a gluten free version of it. 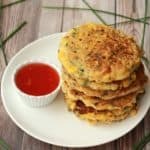 Do you think oat or rice flour would work? Hi Gallo, I would try a gluten-free all purpose flour blend, I don’t think rice or oat flour would hold together well enough. Wow! This recipe is spot on! Best cornbread I’ve ever made and will be my go-to from now on. I’m not vegan (at least yet), but raised my kids vegetarian. My son went vegan in January, and came home from university today for Spring Break. This was my first venture into vegan baking. I used Bob’s Red Mill vegan egg replacement, unsweetened coconut milk beverage, frozen corn and Earth’s Balance vegan butter. I’ve never used an egg replacement and didn’t know what to expect. I didn’t want to wait for a big loaf to bake because the soup was ready to serve, so I made cornbread sticks in a cast aluminum pan that I have that looks like little cobs of corn, and the rest of the batter I split between two small (half-sized) pie pans. I was so pleasantly surprised to see it raise in the oven and the end product was a delicious crumbly, but moist cornbread that was a hit with both of us. We will be having it for breakfast tomorrow morning, and I look forward to trying some more of your recipes! Knowing I can make good vegan baked goods makes going vegan feel much more doable for me. Thank you!! Used less butter and sugar, added a slop of aquafaba, worked out really well! 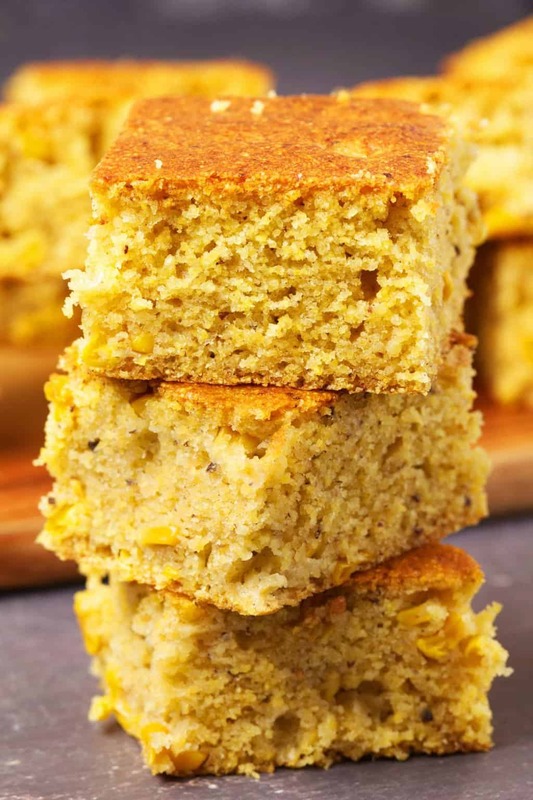 This recipe is my favorite base for a vegan corn bread recipe!! I didn’t use corn kernels, and swapped soy for coconut milk, and coconut oil melted for margarine. It. Is. Divine.